With its silvery beaches, sparkling waters, delectable array of seafood, and abundance of glittering pearls, once you get to Beihai you’ll never want to leave! Beihai is a tropical paradise nestled on the Gulf of Tonkin at the southernmost point of Guangxi. Its name literally means “north of the sea” because that’s precisely where it is. Two thousand years ago, Beihai was one of the main ports of the Maritime Silk Road, providing Guangxi, Yunnan, Guizhou, Sichuan, Hunan, and Hubei with access to foreign trade. Nowadays it provides foreign tourists with an opportunity to marvel at the aquatic wildlife, work on their tans, or sample some of the freshest seafood in Guangxi. If only they could export such wonderful products! The climate in Beihai is subtropical, so it benefits from luxuriously hot weather. The average annual temperate is about 22°C, but in the summer months it can reach highs of 37°C. We recommend visiting the city between April and November, as these months benefit from the most sunshine. The springs and summers are characteristically wet, so you’ll need to bring an umbrella, but the autumns are dry and still pleasantly warm. Throughout the year, the cool sea breeze rushes through the city and provides the locals with fresh, salty sea air. Winter is the driest season but is unusually cold, making poor beach weather. Unless you enjoy sitting on the beach in your coat that is! With a population of only 1.5 million people, Beihai is a relatively small city so you won’t be competing with too many people for the best beach spots. The city’s Silver Beach is one of the most celebrated beaches in China and boasts rare grey-white quartz sand, which is what gives it its distinctly silvery appearance. At night, the moonlight bouncing off of this silvery sand, coupled with the fluorescent seaweed in the water, makes it appear as though the beach is glowing. Near to the beach, there’s a sea-life centre called Underwater World. It features over 2,800 species of aquatic plant life and over 670 species of aquatic animal, all arranged according to their evolutionary order. A few of the main attractions include exhibits of the rare Dugong, Chinese White Dolphin, and cowfish, and the centre’s trusty mascot, a 600-year-old turtle. 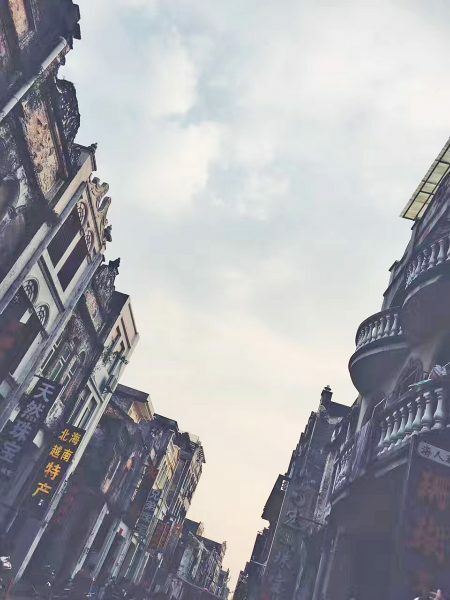 If you’re more interested in the history of Beihai, we recommend visiting the Old Street in the centre of the city, where the remains of several old colonial buildings are preserved, or taking a cruise to the nearby islands of Weizhou and Xieyang. These islands are the perfect places to learn about the fishing cultures of the Tanka or Dan people, from the Hao Dan who catch oysters to the Zhu Dan who dive for pearls and the Yu Dan who make a modest living catching fish. One of the more bizarre attractions on Weizhou Island is a 100-year-old Catholic Church, which sits near to the volcanic park. I suppose it’s easy to imagine what fire and brimstone is like when it’s just outside the door! In the nearby county of Hepu, you can also visit some newly excavated tombs from the Han Dynasty (206 B.C.–220 A.D.), along with a stunningly well restored temple. At the centre of the city, in Beibuwan Square, there’s a tall monument that represents the Pearl of the South. Beihai’s most popular commodity is its pearls, particularly its southern pearls, so it’s the perfect place to buy pearl jewellery for your loved ones or yourself. The best quality pearls are from Hepu County but these can only be bought in eight, designated shops littered throughout Beihai. Along with pearls, shell carving, horn carving, and bamboo woven craftworks are prevalent in the city and make for lovely souvenirs. Unfortunately, the only thing you can’t take away with you is the seafood! Seafood is everywhere in Beihai and, unlike Shanghai and Hangzhou, it is very cheap. Many of the famous local delicacies, such as tiger-fish soup, spicy fried shrimp, ginger-spotted crab, steamed sea oyster and steamed fish with plums, use ingredients that were freshly caught offshore or grown locally. The subtropical climate makes it the perfect place for growing a variety of fruits, which make tasty snacks and perfectly complement the salty seafood with their refreshing sweetness. If you’re feeling particularly brave, you may want to try two of the most popular local delicacies: scalded sand worm and steamed sea cucumber. Although these dishes may look like something out of a science fiction movie, they are actually quite delicious! If you want to sample the freshest seafood in the city, we recommend heading to Seafood Island (Waisha) on the northern shore, where there are many small restaurants offering a variety of tantalising dishes and snacks. The night markets that pop up throughout the city at dusk also offer a myriad of exotic dishes to suit every palate. Since Beihai is one of the lesser known tourist cities in China, accommodation there is still relatively cheap. There are a number of hotels and hostels of varying standards scattered through the city, although we strongly recommend you pay extra to get a room with an air conditioner. Many hotel owners will still barter with visitors, so take a look at the room first and then try to bargain with the hotelier. You never know, they might be so impressed with your bargaining skills that they’ll give you the room for free!